Energy losses in nanowire solar cell can be significantly reduced by 'cleaning' the surface of the cells with a special etching method. This has been shown by researchers at Eindhoven University of Technology (TU/e), Delft University of Technology and Philips in a paper published today in the journal Nano Letters. The solar cell has an efficiency of 11.1%, putting it just below the current world record, but it was reached with much less use of material. This is the latest step forward in the rapid development of this type of solar cell in recent years. The nanowire solar cell is a relatively new type of cell in which a bundle of semiconducting wires, each with a thickness of around 100 nanometers (1 nanometer is a millionth of a meter), collect light and convert it into electricity. Big advances have been made in the development of this type of solar cell in recent years, and the efficiencies achieved are increasing rapidly by around 5% per year – much stronger growth than that of competing solar cell technologies. A big advantage of thin nanowires is the greatly reduced need for costly semiconductor material, which means they can be produced at low cost. However a disadvantage is their large surface area relative to the volume – and the surface is exactly where imperfections in the material lead to high energy losses. In the publication in Nano Letters the researchers, led by prof.dr. Erik Bakkers and dr. Jos Haverkort, describe a method to make the surface of indium phosphide nanowires much smoother, with fewer imperfections. They do this using an etching method that they have developed themselves – called 'piranha etching' – in which the surface is 'cleaned' by a chemical reaction. Their solar cell reaches an efficiency of 11.1% – slightly less than the current world record of 13.8% which was achieved earlier this year by a group of Swedish, German and Chinese researchers using nanowires made of the same material. However the nanowires of the Dutch researchers are only 40% as thick. Since the efficiency normally falls as the wires become thinner, the expected efficiency should be only around 4.5%. Which means the 'cleaning job' in fact gives a significant boost in efficiency. The researchers see opportunities to raise efficiency further in the near future with little extra use of resources. 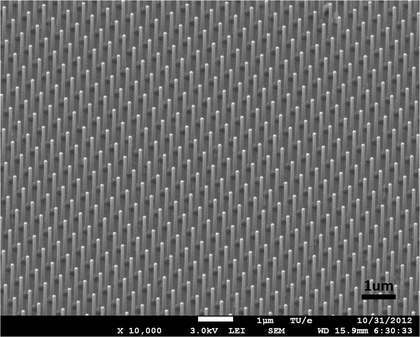 "By varying the thickness of the nanowires and improving the way the crystals inside them are stacked, we think we should soon be able to approach an efficiency of 20%", says Bakkers. In the longer term, it should in theory even be possible to reach efficiencies of 65% by stacking multiple subcells. Needs editing - a nanometer is a billionth of a meter, not a millionth. 11% efficiency isn't exciting, and even approaching 20% would not be game-changing. But if they can actually stack sub-cells in practice at not too high a cost (a big if) and approach 65% efficiency, it would be a huge deal, and so is worth pursuing.